Bright Star (Sirius) is a recent acquisition and recently installed in the High Museum of Art's Modern & Contemporary gallery (actually, in a two-story stairwell in the gallery). The last chandelier I saw there was a Mori chandelier called "Speak of Me," made entirely of black glass...the contrast between the two is stunning. As a space enthusiast, I'm even more in love with the piece knowing its named for the brightest star in the heavens as seen from Earth. Sirius, also known as the "Dog Star," is actually two stars, Sirius A and Sirius B. So, that the artist used two rods per "ray" is something I find as rather clever. Just for the record, Sirius A is approximately 25 times more luminous than our own Sun. 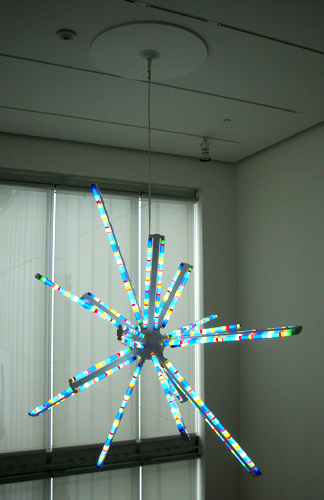 Speaking of the artist, American-born Spencer Finch's artistic manifestations are, regardless of the outward subtlety, the result of a deep contemplation.